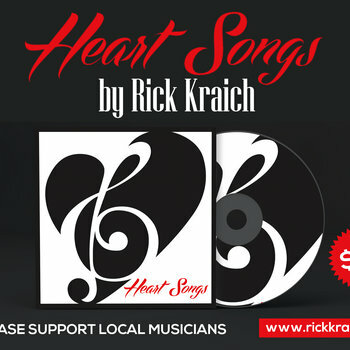 I would like to personally thank all those who have purchased 'Heart Songs.' What is really cool is that on most of the sites where my music is available I get an email letting me know who purchased the physical C.D. or a download. I appreciate it so very much. My new album 'Heart Songs' will be released to digital sites on or shortly before March 18th, 2016. It will also be available for download of the c.d. itself can be purchased at www.cdbaby.com/rickkraich, www.rickkraich.com or at www.facebook.com/rickkraichmusic and a slew of other online stores.